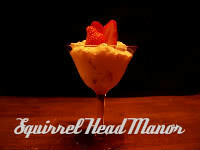 Squirrel Head Manor: Breakfast - I never miss it! 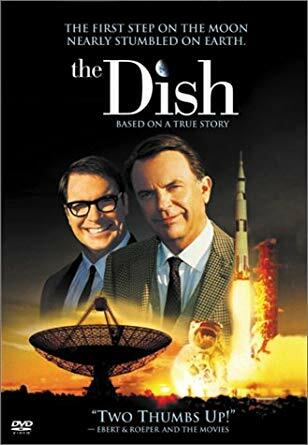 Breakfast - I never miss it! Recently I was contacted by MyBlogSpark to spread the word about General Mills breakfast cereals. I don't mind doing that at all since I eat Cheerios and other General Mills creals every single day. I am not a person who likes missing breakfast! good coupons. 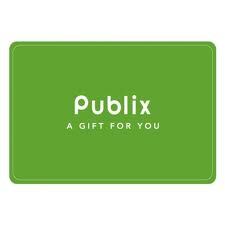 Also, I know Publix isn't a market in all locations but if you do shop there, check out their site for more coupons and deals - Click on the link PUBLIX. MyBlogSpark provided me with a gift card so I could stock up on the breakfast items I enjoy most. Thank you! 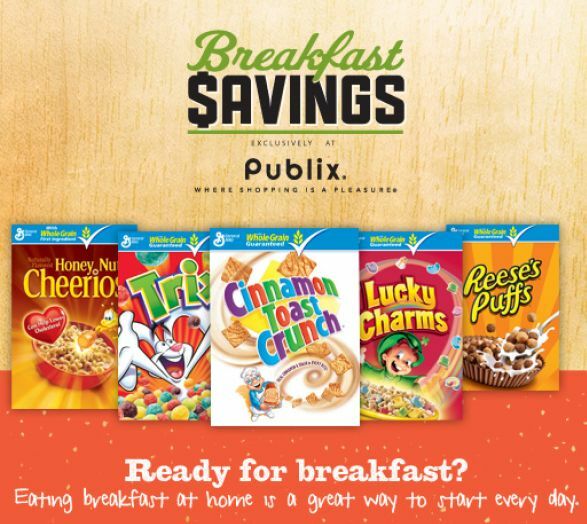 April 1st – April 10th during the Publix® Breakfast Savings event, take advantage of great savings on some of your family's favorites like Honey Nut Cheerios, Cinnamon Toast Crunch and other General Mills breakfast items. 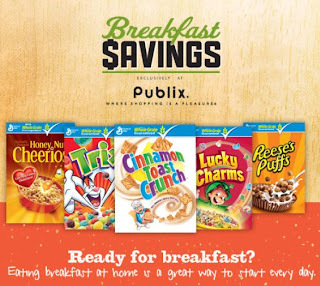 For coupon offers on varieties your whole family will love, visit the Publix Breakfast Savings page. What breakfast items do you like to have on hand to get your day started? What is your favorite cereal combo? Usually I mix chocolate Cheerios with the Honey Nut and that's a pretty good combination. Feel free to share your favorites here! I never miss breakfast, either...even if it's just something small. In a pinch (or when feeling lazy), I usually turn to toast with some yummy topper. But we always have eggs on hand, as well. I don't mix my cereals, but my hubby does - usually cheerios and some sort of granola-type cereal. I love cereal for breakfast. Had Honey Nut Cheerios just this morning. But, I don't mix them either. I haven't had Trix for years, but I just might go get some now.